This resulted in a traffic jam on the entire stretch. Eight people were killed after 50 vehicles collided with each other on Rohtak-Rewari highway due to dense fog conditions on Monday morning. This resulted in a traffic jam on the entire stretch. Meanwhile, the administration has rushed in several JCBs to clear the road for movement. 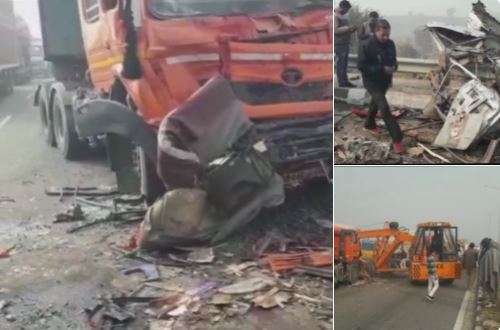 The accident took place on the Jhajjar bypass, resulting in a pileup as multiple vehicles rammed into each other due to reduced visibility caused by dense fog in the area, police said, reported news agency PTI. The victims were travelling in a jeep. "As the cruiser jeep was involved in an accident with a truck, other vehicles which were close behind also rammed into each other," a Jhajjar police official said.